January 2019. Mayor's reception. It's going to be a great year! Funding surprise. Getting fit for life. Parents/carers' meetings 2019. Volunteering at Share. 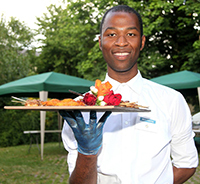 The Worshipful the Mayor of Wandsworth, Councillor Piers McCausland, is holding an evening reception on 1st February 2019, from 7:30pm to 9:30pm with drinks and canapés, as a fundraiser for his three charities for support during his mayoral year, one of which is Share Community. We are honoured to have been chosen as one of Cllr McCausland's charities, and we're grateful to him and his team for putting in time, care and effort to organise what promises to be a super evening. Please do come along and show your support. The event takes place at the Marble Hall at Wandsworth Town Hall. Tickets are £25. Say hello to 2019 with Share's Impact Report and 2019 Calendar which features a collection of poems written by our creative writing students and artwork produced by Share students. 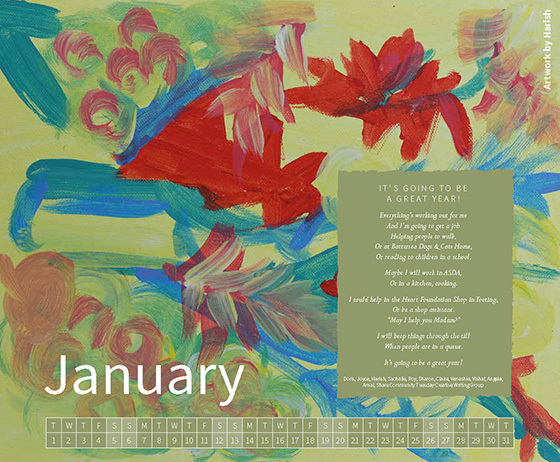 January's poem predicts 'It's going to be a great year!' and we really hope so! We have great plans for the coming year to grow Share and support even more students to reach their potential, and live happier, healthier and more independent lives. Download your copy of our Impact Report and Calendar from Share's website at http://bit.ly/2F3y7U0 or email marcomms@sharecommunity.org.uk if you would like us to send you a hard copy. We were surprised and delighted to be awarded a grant of over £60,000 by a charitable trust that wishes to remain anonymous. This was a wonderful way to start the new year, and means that we can continue to grow and develop our health and wellbeing services. We’re deeply grateful to the trust concerned, who also fund one of our other projects. Thanks to their generosity, we can empower people with learning disabilities to make healthy lifestyle, food and exercise choices. 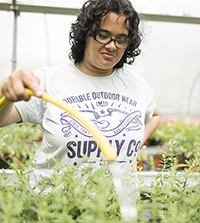 People with learning disabilities have been found to die much earlier – up to 20 years on average – than the rest of the population, and we’re determined to do everything we can to make this a thing of the past by ensuring that people get the health information they need in accessible formats; learn how to cook simple, fresh and healthy food; discover the joys and variety of exercise; and find out how to reduce stress and stay mentally healthy. 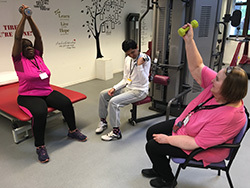 Students taking part in Share's Live Well, Feel Great project, funded by the Wimbledon Foundation, having been going to the gym, and seeing great results! Around 87% of those who took part in these gym sessions saw an improvement in their weight, body mass index (BMI) and functional muscle strength. And 50% of students were able to improve their cardiorespiratory function, endurance and flexibility. To find out more about our healthy living work, contact Jenny Bourlet, Share's Healthy Living Coordinator via email jennyb@sharecommunity.org.uk. 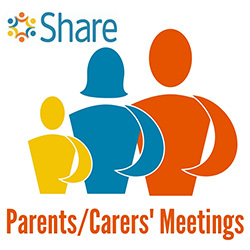 We hold regular meetings with parents and carers of Share students to hear their views, issues and concerns, and to find out how we can help them to support the person they care for. These meetings take place every two months at Share's offices in Battersea. We have now set the dates for our parents/carers' meetings for 2019 so please do join us and have your say. 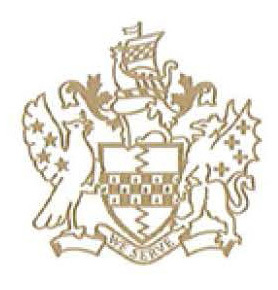 January's meeting will take place on Wednesday 23rd January 2019 from 10am to 11.30am. To book your place at one or all of these meetings, contact Karen Miles, Share's Wellbeing and Outreach Manager, via email karenm@sharecommunity.org.uk or telephone 07445365365. At Share, we are very proud of our mission, vision and values. We're a community organisation that thinks big, placing the people we support at the heart of service development through innovation, while working with respect, compassion and kindness. We're always looking for great volunteers who want to share their experience, passion and hobbies with our students, and who share our vision of a world in which diversity is valued and everyone is treated equally. To find out more about volunteering, visit our website to find out more about our work or contact Leanne Wood, Share's People and Projects Manager, via email leannew@sharecommunity.org.ukor telephone 020 7801 9825 for more details. For further information, visit Share's website, email info@sharecommunity.org.ukor telephone 020 7924 2949. If you would like to find out more about enrolling at Share or would like to arrange a visit, fill in our online enquiry form, email info@sharecommunity.org.ukor telephone 020 7924 2949.